The story of the blind men and an elephant originated in the Indian subcontinent from where it has widely diffused. It is a story of a group of blind men (or men in the dark) who touch an elephant to learn what it is like. Each one feels a different part, but only one part, such as the side or the tusk. They then compare notes and learn that they are in complete disagreement. It is a parable that has crossed between many religious traditions and is part of Jain, Buddhist, Sufi, Hindu and Bahá’í lore. The tale later became well known in Europe, with 19th century American poet John Godfrey Saxe creating his own version as a poem. The story has been published in many books for adults and children, and interpreted in a variety of ways. 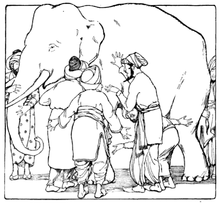 In various versions of the tale, a group of blind men (or men in the dark) touch an elephant to learn what it is like. Each one feels a different part, but only one part, such as the side or the tusk. They then compare notes and learn that they are in complete disagreement. The stories differ primarily in how the elephant's body parts are described, how violent the conflict becomes and how (or if) the conflict among the men and their perspectives is resolved. In some versions, they stop talking, start listening and collaborate to "see" the full elephant. When a sighted man walks by and sees the entire elephant all at once, the blind men also learn they are all blind. While one's subjective experience is true, it may not be the totality of truth. If the sighted man were deaf, he would not hear the elephant bellow. The ancient Jain texts often explain the concepts of anekāntavāda and syādvāda with the parable of the blind men and an elephant (Andhgajanyāyah), which addresses the manifold nature of truth. This parable resolves the conflict, and is used to illustrate the principle of living in harmony with people who have different belief systems, and that truth can be stated in different ways (in Jain beliefs often said to be seven versions). This is known as the Syadvada, Anekantvada, or the theory of Manifold Predications. 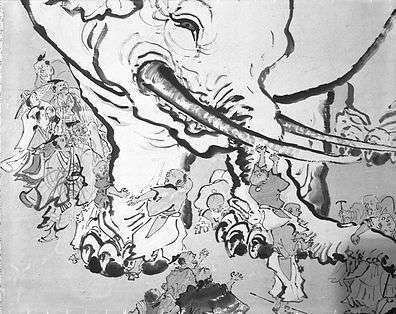 Blind monks examining an elephant, an ukiyo-e print by Hanabusa Itchō (1652–1724). For preacher and monk the honored name! For, quarreling, each to his view they cling. Such folk see only one side of a thing. ^ Wang, Randy. "The Blind Men and the Elephant". Retrieved 2006-08-29. The Persian Sufi poet Sanai of Ghazni (currently, Afghanistan) presented this teaching story in his The Walled Garden of Truth. A number of blind men came to an elephant. Somebody told them that it was an elephant. The blind men asked, ‘What is the elephant like?’ and they began to touch its body. One of them said: 'It is like a pillar.' This blind man had only touched its leg. Another man said, ‘The elephant is like a husking basket.’ This person had only touched its ears. Similarly, he who touched its trunk or its belly talked of it differently. In the same way, he who has seen the Lord in a particular way limits the Lord to that alone and thinks that He is nothing else. One of the most famous versions of the 19th century was the poem "The Blind Men and the Elephant" by John Godfrey Saxe (1816–1887). Each in his own opinion concludes that the elephant is like a wall, snake, spear, tree, fan or rope, depending upon where they had touched. Their heated debate comes short of physical violence, but the conflict is never resolved. Natalie Merchant sang this poem in full on her Leave Your Sleep album (Disc 1, track 13). The story is seen as a metaphor in many disciplines, being pressed into service as an analogy in fields well beyond the traditional. In physics, it has been seen as an analogy for the wave–particle duality. In biology, the way the blind men hold onto different parts of the elephant has been seen as a good analogy for the Polyclonal B cell response. "Blind men and elephant", from Martha Adelaide Holton & Charles Madison Curry, Holton-Curry readers, 1914. ...people address themselves to this story in one or more [...] interpretations. They then accept or reject them. Now they can feel happy; they have arrived at an opinion about the matter. According to their conditioning they produce the answer. Now look at their answers. Some will say that this is a fascinating and touching allegory of the presence of God. Others will say that it is showing people how stupid mankind can be. Some say it is anti-scholastic. Others that it is just a tale copied by Rumi from Sanai – and so on. Shah adapted the tale in his book The Dermis Probe. This version begins with a conference of scientists, from different fields of expertise, presenting their conflicting conclusions on the material upon which a camera is focused. As the camera slowly zooms out it gradually becomes clear that the material under examination is the hide of an African elephant. The words 'The Parts Are Greater Than The Whole' then appear on the screen. This retelling formed the script for a short four-minute film by the animator Richard Williams. The film was chosen as an Outstanding Film of the Year and was exhibited at the London and New York film festivals. The story enjoys a continuing appeal, as shown by the number of illustrated children's books of the fable; there is one for instance by Paul Galdone and another, Seven Blind Mice, by Ed Young (1992). In the title cartoon of one of his books, cartoonist Sam Gross postulated that one of the blind men, encountering a pile of the elephant's fewmets, concluded that "An elephant is soft and mushy." Six blind elephants were discussing what men were like. After arguing they decided to find one and determine what it was like by direct experience. The first blind elephant felt the man and declared, 'Men are flat.' After the other blind elephants felt the man, they agreed. ↑ Martin Gardner (1 September 1995). Famous Poems from Bygone Days. Courier Dover Publications. p. 124. ISBN 978-0-486-28623-5. Retrieved 2012-08-25. 1 2 "Elephant and the blind men". Jain Stories. JainWorld.com. Retrieved 2006-08-29. ↑ Hughes, Marilynn (2005). The voice of Prophets. Volume 2 of 12. Morrisville, North Carolina: Lulu.com. pp. 590–591. ISBN 1-4116-5121-9. ↑ Mallisena, Syādvādamanjari, 14:103–104. Dhruva, A.B. (1933) pp. 9–10. ↑ Mallisena, Syādvādamanjari, 19:75–77. Dhruva, A.B. (1933) pp. 23–25. ↑ Accesstoinsight.org Archived index at the Wayback Machine. ↑ Included in Idries Shah, Tales of the Dervishes ISBN 0-900860-47-2 Octagon Press 1993. 1 2 Arberry, A.J. (2004-05-09). "71 – The Elephant in the dark, on the reconciliation of contrarieties". Rumi – Tales from Masnavi. Retrieved 2006-08-29. ↑ For an adaptation of Rumi's poem, see this song version by David Wilcox here Archived October 9, 2010, at the Wayback Machine..
↑ Gupta, Mahendranath (11 March 1883). "Chapter V – Vaishnavism and sectarianism – harmony of religions". Kathamrita. Vol. II. ISBN 81-88343-01-3. ↑ For example, Quantum theory by David Bohm, p. 26. Retrieved 2010-03-03. ↑ See for instance The lymph node in HIV pathogenesis by Michael M. Lederman and Leonid Margolis, Seminars in Immunology, Volume 20, Issue 3, June 2008, pp. 187–195. ↑ Shah, Idries. "The Teaching Story: Observations on the Folklore of Our "Modern" Thought". Retrieved 2010-03-05. Wikimedia Commons has media related to Blind men and an elephant. Jalal al-Din Muhammad Rumi. " Book III". Masnavi I Ma'navi. Trans. Edward Henry Whinfield. Wikisource. All of Saxe's Poems including original printing of The Blindman and the Elephant Free to read and full text search.